Removes stains first time. Removes stains even in a quick wash. With Celluclean® technology for whiter whites (vs previous formulation). Helps remove tough stains like grease, mud and chocolate ice-cream. Works efficiently at lower temperatures. Have you tried the full Persil Bio range? Also available in powder, capsules and powergems. Tackling tough stains can be a challenge, but with Persil Bio Liquid Detergent stain removal is simple. It offers effective stain removal even in a quick wash, making it the perfect laundry detergent for any busy routine. 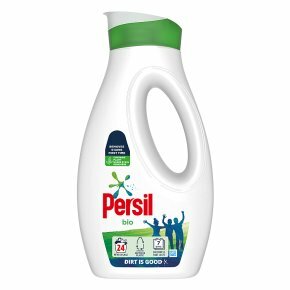 Packaged in a convenient flip top bottle with a pouring spout, Persil liquid laundry detergent is quick and simple to use. Persil liquid also comes with a free Stain Eraser Dosing Ball to make pre-treating stains easy. Persil?s improved biological formula with celluclean® technology gives you whiter whites*. It provides great stain removal for common stains including mud, grass and grease stains Dosage: Follow these instructions for the best results with Persil bio liquid. Before first use, remove the safety cap by peeling gently towards the spout. Dispose of carefully. Pour the correct dosage of Persil liquid into the Stain Eraser Ball (check the product label for full dosing instructions for your load size) and place on top of the clothes in the washing machine drum. Check the garment care labels before selecting the appropriate temperature and wash cycle. Do not use on silk, wool or other delicate fabrics. To pre-treat stains, pop the Stain Eraser Ball out of the middle of the bottle, pour a small amount of neat liquid detergent into the ball and apply directly to the stain, then rub the area gently with the base of the Stain Eraser Ball to help loosen the stain. After pre-treatment, place the garment in the washing machine with the recommended dosage of Persil liquid.